The Rapala 15lb or 50lb Digital Scale is compact and accurate with a large digital display, tare weight, lighted display sum total memory in a water resistant design. 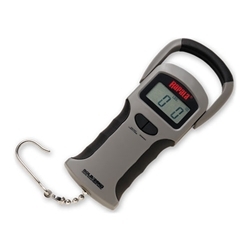 This Digital Scale is the perfect size for convenient storage in tacklebox or boat glove. You can choose from pound or kilogram settings.